Nearly two dozen Kellogg Community College Police Academy cadets, Emergency Medical Services students and KCC employees will take the plunge into icy winter waters this month for an event to raise funds for Special Olympics Michigan. It’s all part of the annual Kalamazoo and Calhoun County Polar Plunge, through which teams and individuals collect donations leading up to a jump in an outdoor pool – often in close to freezing temperatures. The event this year starts at 10:30 a.m. Saturday, Feb. 16, at Bell’s Eccentric Cafe, 355 E. Kalamazoo Ave., Kalamazoo. 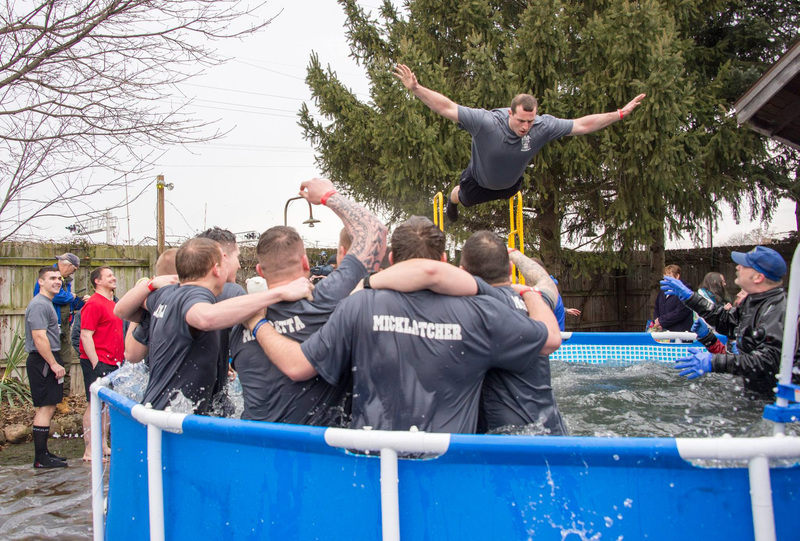 The KCC Police Academy, led by team captain and Public Safety Education Director Rob Miller, has fielded a polar plunge team for the past several years, raising more than $22,000 since 2013. The Police Academy and KCC EMS teams together this year have already raised $6,200 — nearly three times the College’s $2,249 total from 2018 and almost a third of the nearly $20,000 raised by all participating teams thus far. Individuals interested in participating this year can join one of KCC’s teams or support them by donating online at www.firstgiving.com/team/382937 (for the Police Academy team) or www.firstgiving.com/team/385432 (for the EMS team). For more information about KCC’s Police Academy, EMS Program or other Public Safety Education programming at the College, visit www.kellogg.edu/public-safety-education. Pictured above, KCC Police Academy cadets cheer on a fellow student as he jumps during the polar plunge event at Bell’s in 2017.